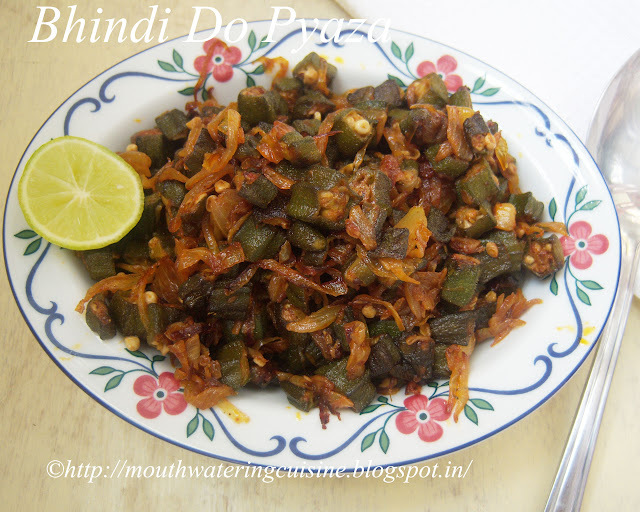 Bhindi Do Pyaza is a North Indian dish. It is served with roti or rice. A very simple and easy recipe. I served it with rice only. Wash bhindi and wipe them with clean cloth. Cut them into 1"long pieces. Heat oil in a kadai. Add cumin seeds, when they start spluttering add bhindi. Fry them for a while. Or till they half fried. At this stage they become slightly tender. Add onions and salt, turmeric powder and red chilli powder. Mix well. Saute it occasionally till the onions and bhindi cooked completely. Once they are done, add garam masala and aamchur powder. Mix well. Serve bhindi do pyaza with roti or rice. Thank you for visiting my blog. Hope you like my recipes. Any feedback and comments are appreciated.